Ken, born and raised in Ontario, Canada, is robust and passionate about his vineyards and wineries. 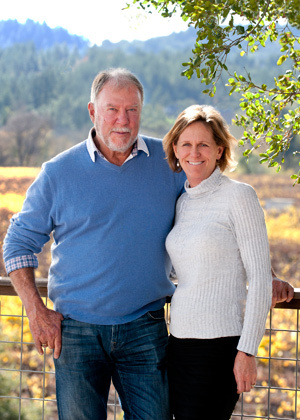 Ken and his wife Diane started buying land in western Dry Creek Valley in the early 1980s, planting their first vines in 1988. Establishing himself further as a grower of quality wine grapes, Ken continued to acquire and plant more fruit in the 1990s. Ken Wilson said he and Diane were interested in making wine early on, but they didn’t start until 1993, when they bought the historic Fredson Winery from the retiring Chris Fredson. “It was an intriguing old bulk wine facility in what was really a barn,” Wilson said. “It was 100 years old, and still contained the original redwood vats and tanks.” He and Diane, who has a background in biochemistry, then began fulfilling their dream: making their own wine. The first was a 1994 Reserve Cabernet Sauvignon. Getting county permits and restoring the old barn took a few more years. By 1998, the complete winemaking operation was housed in what is now Wilson Winery. Slowly it grew to include additional varietals, and the annual production is now about 3,000 cases. Today, Ken and Diane farm more than 600 acres of Dry Creek Valley hillside vineyards. In addition to his prowess at securing premium grape-growing vineyards and winery sites, Ken is known for his hands-on approach to everything from farming to construction. Attention to detail and getting his hands dirty brick-by-brick has been Ken’s labor of love—it’s not unusual to see Ken driving a tractor or wielding a hammer as he immerses himself in each of his projects. With his larger than life personality, Ken is a favorite of the Wilson Artisan Wine club members and can often be seen at events enjoying the great social aspects wine country life affords. It was Ken’s wisdom and vision that created the diversity of vineyard sources over the years. These vineyards provide the premium quality fruit that has brought notable recognition to the Wilson Artisan Wineries. Ken and his wife Diane now own eleven wineries offering exceptional wines, beautiful scenery and friendly, informative staff along with two Healdsburg Inns.